Subject: Requesting For updating the passbook and issuing a certificate of bank balance. With due honour, I would like to infrom you that we are doing business with your bank since long ago. You know, today is the last day of our financial year, 2011. For the purpose of verification of bank balance and closing the year ending accounts, we require the balance of our Current Account bearing no. 1002-220-4521 with your bank. Therefore, we request your kind honour for posting the transactions made in the pass book and thereby issue a certificate of balance up to December 31, 2011 and thus oblige thereby. 38. 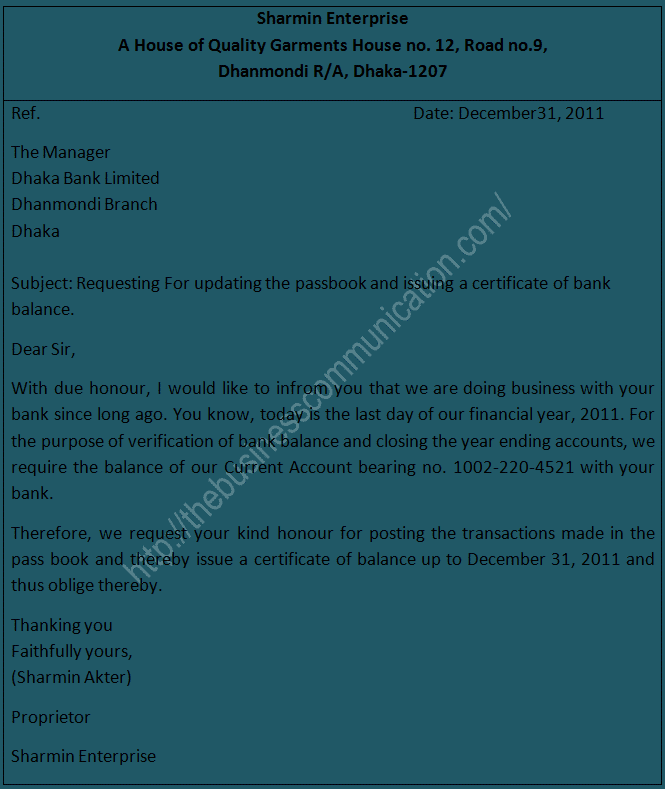 Write a letter to your banker requesting them to update the passbook and issue a Certificate of Balance. Filed Under: Letter Writing Tagged With: passbook and issuing, Write a letter to your banker requesting them to update the passbook and issue a Certificate of Balance? Good article about bank passbook updating and bank balance certificate.thanks for it.clear explanation and simple keep up the good work!